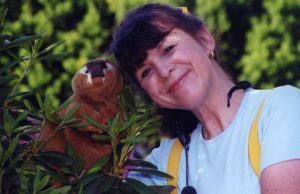 Pam Minor has been entertaining children for many years with her interactive songs, humorous routines, puppetry and ventriloquism. She has appeared on Comcast on Kids’ Videos on Demand. Pam was a regular cast member and writer for the Emmy award winning children’s TV show “It’s Kindertime” on the ABC affiliate WMAR TV2 during its nine year run. She co-wrote and co-produced the CD “Musical Manners” with Karen Rupprecht, which won the Parents’ Choice Recommended Listening Award. She is a partner with Port Discovery Children’s Museum and appears there monthly. Pam has released eleven CD’s to date. Many of her songs are utilized by teachers and are available for download through SongsForTeaching.com. Pam the Kindersinger songs can also be streamed on Pandora and Spotify! Pam has the approval of the Maryland State Arts Council, Anne Arundel, Howard, Harford, Montgomery County Arts Councils, and performs at many schools throughout our tri-state region.. She also has performed for the Delaware State Library system, the Governor of Maryland, the Greenbrier Resort, Maryland Zoo, the National Aquarium in Baltimore, many schools, malls, libraries and festivals both in Maryland and out of state. Pam the Kindersinger would be a great asset at your special event too! As the children’s entertainer, Pam the Kindersinger, Pam Minor performs fun, educational, interactive programs for children in Maryland, Delaware, Pennsylvania, Virgina, West Virgina, and beyond. Her energetic shows include singing, dancing, puppetry, and comedy!